i-INK2 - The Second Generation is Here! Introduced in 2003, the original i-INK from InkRepublic was revolutionary in its ability to support professional photo printing. i-INK fundamentally changed the printing industry by providing unprecedented performance, reliability and affordability in a simple and professionally designed package. The new i-INK2 builds on the original i-INK design by incorporating the latest and greatest ink technology. The use of these latest generation components enables i-INK2 to offer superior performance and reliability for demanding applications - intensive photo printing, T-shirt printing, screen printing, etc. Real-world performance is the most important factor to consider when purchasing a Bulk Ink system. i-INK2 is guaranteed to provide the BEST prints and the BEST ink-flow rate. i-INK2 offers superior output at a lower cost, including lower ink usage and less ink wasted in cleaning procedures compared to the cartridges. We stand behind this claim 100%. R260 is a 6-Color Ink Jet Printer (Cyan, Magenta, Yellow, Black, Lt Cyan, and Lt Magenta ink). With our InkRepublic i-INK2 R260/R265/R280/R380/RX580/RX595/RX680 Bulk Ink Kit, you can convert your printer into a non-stop continuously printing monster. No more Ink Cartridge purchase, No more Cartridge replacement. Less head clog issues = Less ink wasted in head cleaning. Use on any type of paper. Work with Dye, Pigment or Sublimation inks. 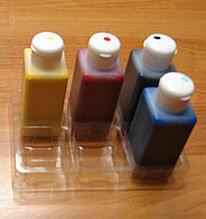 Advanced auto-reset chipset can avoid clean cycles and save more ink. 1. 6x Dampers with Ink Tubes, Ink Stopper, and Vacuum Pump. * Where can I find the manufacture date of my printer? * By Clicking this button, you will be brought to our Paypal shopping cart window. It is fast and secure !